Your parakeet's sleep cage should be distraction-free. Just like people, parakeets get cranky without enough sleep. Unlike people, though, a cup of coffee is no substitute for a restless night. Covering your bird's cage at night gives him just the environment he needs to get plenty of beauty sleep and wake up feeling fresh in the morning. Set up a second cage for your parakeet. Smaller than his daytime cage, this is called his "sleep cage." Place it in a quiet room. For example, if his daytime cage is in a room that faces the street, put his sleep cage in a secluded spot, like the laundry room or guest room. Make sure, also, that the temperature in the room is not extremely hot or cold. While covering the cage helps trap in heat, do not put the cage in an unheated area, like a garage or coat room. 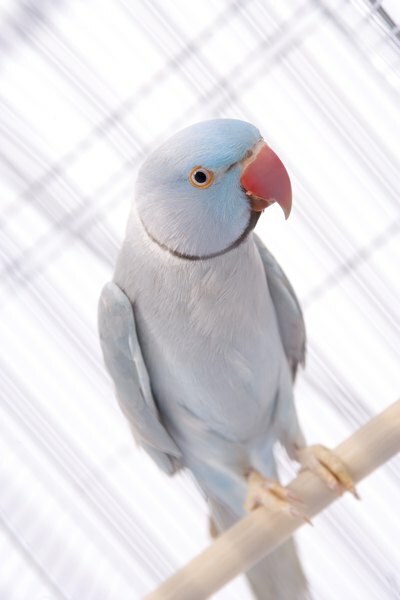 Transfer your bird to his sleep cage at night, or whenever he typically goes to sleep. Remember, parakeets need between 10 and 12 hours of sleep every day. Drape the cage in a thick cover. This can be either a cage cover from the pet supply store or even a blanket or towel, but in any case, it should be a dark color. Covering the cage simulates the bird's natural sleeping environment, as well as preventing any potentially startling distractions, like other pets. Uncover the cage gradually in the morning. Don't dramatically yank off the cover like a stage magician, as the sudden change in light can frighten and anger a parakeet. Instead, slowly lift off the cover, then gradually raise the lights in the room, using a dimmer switch, lamps or window blinds. Why Does It Look Like My Parakeet Is Falling Asleep When I Touch It? Why Do Birds Stop Squawking When You Cover the Cage? How Do Parakeets Sleep Without Falling Off of Their Perch?